If Italy is going to avoid a full-blown euro zone debt crisis that’s capable of causing turmoil in global financial markets, communication will be key. It’s also the debt-to- GDP ratio that makes it particularly dangerous. Some analysts have pointed to the fact that France has been running much larger budget deficits for years, but France is a far larger economy with a smaller debt burden. 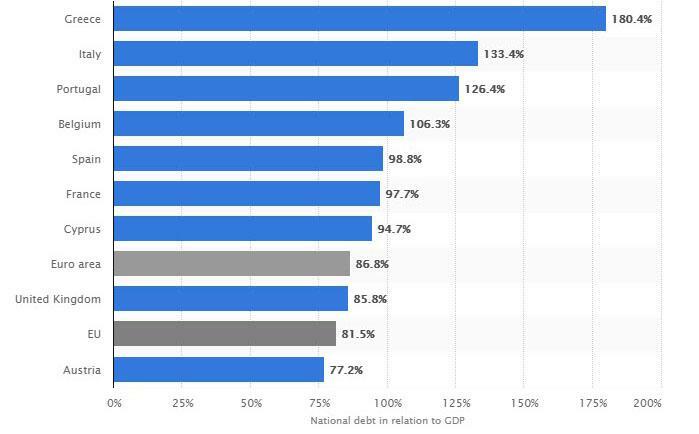 Its debt/GDP ratio is just below 100%; the equivalent metric for Italy is over 130%. This isn’t to argue that disaster is inevitable. If Italy and the EU convey some sense of coordinated belief that Italy’s debt burden will ease in the years ahead, investors will then be inclined to give the country the benefit of the doubt, especially given the yields on offer. But there’s no sign of compromise as the deadline for budget submission approaches and the threat of ratings downgrades loom ever closer. On the weekend, European Commission President Jean-Claude Juncker called on Italy to redouble its fiscal efforts; Di Maio responded by saying the country won’t retreat on its fiscal plans. Unless the relevant officials start communicating in a more positive and coordinated fashion, then Italian yields will continue to spiral and contagion will spread. Five days ago, I wrote that the Italian debt crisis had crossed the Rubicon. It was exactly five days after Caesar’s crossing in 49 BC that the leaders of the Roman Republic fled the capital rather than making any attempt to compromise with Caesar. For the sake of more than just the Italian bond market, let’s hope we see a much more constructive reaction from today’s Italian government.